My actual thirty-ninth birthday was a mess. I was supposed to be spending it at Walt Disney World, but obviously that didn’t happen. The best laid plans, and all. First of all, a rain storm woke me up at 6 AM so I decided to go back to sleep rather than getting up and getting drenched going to work that early. It was going to be my first day back at work after the holidays, but I was still tired after battling the flu and its aftermath for over a week. Under the circumstances, the pouring rain was more than I thought I was capable of dealing with. Work was stressful considering that I had to catch up on all of the emails that had been piling up in my inbox since December 21st. Also, there were more than the usual number of meetings which made the day even more frantic. I was pretty worn out when the workday was over, but I decided to go to a boot camp class at 7 PM since I wasn’t keen on spending the rest of my birthday simply sprawled out on my couch. It was my first time at the gym for at least a month so it was very challenging. I was sore for a week afterwards, and it turns out I wasn’t healthy enough to be exercising yet anyway. I felt pretty sick the next day. But at the time I was glad to get out of the house for an hour. On the way home from boot camp I stopped by Panera and picked up a bowl of tomato soup for dinner. Not exactly the birthday dinner I planned, which was a steak dinner at Le Cellier in EPCOT, but at least the soup tasted good. To make up for the disaster that was January 9th, I celebrated my honorary thirty-ninth birthday last Sunday. Unfortunately I had to get up at 4:30 AM to get ready for the Pasadena 5K. It was a cold morning by Southern Californian standards and I carpooled to the Rose Bowl with one of my running buddies who doesn’t have a functional heater in her car. Not the best decision when it’s 39 degrees outside and you didn’t think to dress warmly enough. I should have driven instead. But even without heat we still stayed in the relative warmth of the car until 10 minutes before the race started. The 5K itself was pretty good, and the finish line was on the Rose Bowl field, which I enjoyed. My plan for the afternoon was to meet my good friend Natalie and her family at Disneyland, but I was tired after I got home from the race. Luckily a short nap re-energized me and I made it to Anaheim just in time to join them for lunch at Carthay Circle. A meal of tri-tip and cheesy mashed potatoes definitely made up for eating boring tomato soup for dinner on my actual birthday. It was absolutely delicious. 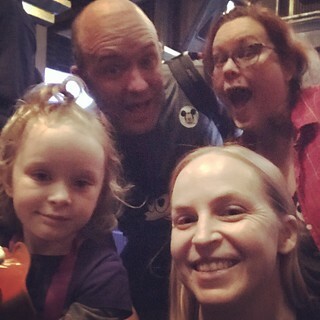 After that we made our way to Guardians of the Galaxy where my 5 year-old goddaughter surprised everyone by agreeing to ride it. What a perfect birthday present. She’s a real trooper. We also went on It’s A Small World Holiday (the last day before they removed the Christmas decor) and Peter Pan’s Flight before we decided it was time to go to our respective homes. I was hoping to check out the new scenes on Star Tours, but the line was long and I knew I needed to rest rather than push myself to stay at Disneyland longer. Luckily it will still be there on my next visit, which I hope is too far in the future. It was a lovely belated birthday celebration, even it if wasn’t the one I originally planned.